(Frying pan size (D H): 15.5cm x 3.8cm(approx.). 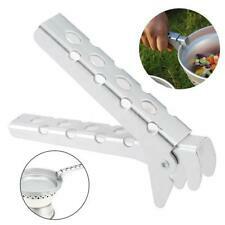 - A Full Set of Kitchen Utensil For Outdoor Picnic. 1 x Frying pan. - Rice ladle size (L W): 14 x 5cmapprox.). 1 x Rice ladle. - Non-slip pan and pot. Frying pan: 148x31mm. 1 x Frying Pan. 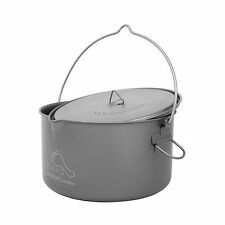 The pot has folding handles for space saving and compactness. Big pot: 142x66mm. Small pot: 123x65mm. 1 x Big Pot. 1 x Small Pot. Pan cover: 130x17mm. TOMSHOO water cup is made of corrosion-resistant titanium material, lightweight and durable to use. Capacity: 750ml. 1 Storage Sack. Titanium imparts no taste and odor on food or beverage. 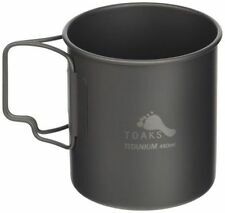 1 Titanium Mug. Simple, portable and durable. Material: Stainless steel. We will do our best to solve your problem. Depth: 4.5cm. Color: Silver. 1: Titanium frying pan is 4.5cm deep, making it easy to flip food. It is also good to heat leftovers. 5: Silicone cleaning brush does not touch the oil, does not hurt the pot, quickly clean the titanium frying pan. This Kit includes a stove base and brass burner with plastic fuel bottle. New, unused condition. Frying pan: Approx. ModelCamping Cookware Bowl Pot Pan Set. 1 x Frying Pan. Suitable ForCamping Hiking Cooking Picnic. Big pot:Approx. Small pot: Approx. The pot has folding handles to save space and carry conveniently. With non-stick camping cookware, you can cook delicious food even during outdoor activities. - Lightweight and folding design, convenient for storage and carry to anywhere for traveling. - Foldable handle with silicone tube cover to protect you from burning. This cookware set is in good condition. Together it is 5 1/2" tall X 7 3/8" across as seen in first photo. TOMSHOO water cup is made of corrosion-resistant titanium material, lightweight and durable to use. 300ml capacity. Capacity: 300ml. Titanium imparts no taste and odor on food or beverage. 1 Titanium Cup. 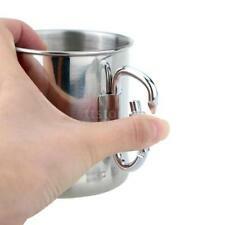 1 Piece Aluminum Camping Cup. - Great for camping, RV, around the house, office, outdoor, etc. - Aluminum materaisl, ultra-light and easy to carry. - Eco-Friendly - plastic free, paint free, BPA free, safe and health. Great Kelly Kettle Stainless Steel. Used no dents. Works Great. Not Rusted Out. Pot Handle. Pot Holder. Nylon Carry Bag. Fire Base. Capacity: 750ml. 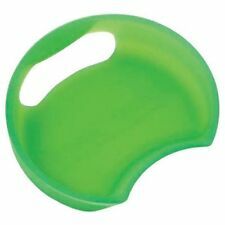 This item can be used as a water cup and pot. It is made of stainless steel, corrosion-resistant and durable. 1 Stuff Sack. Foldable grip handle for convenient use and storage. With a wire bail to use a pot hanging over campfire. 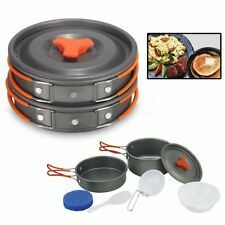 14x Camping Cookware Carabiner Set Outdoor Pots Pan Stove Hiking Cooking Picnic. Outdoor cooking is easy when you have the right kit. With just a pot and heat source, you won't have to settle for sandwiches when you're camping. Finding the right camping cook set for your next outdoor adventure is simple when you know your options. What options are there for camping cookware? 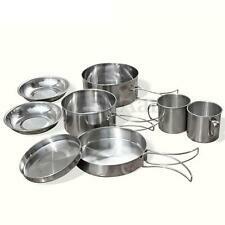 Cook sets vary in numbers of pieces, but they are generally made to fit together in space-saving bundles. Sets often contain a pot or two and a skillet. Some sets include cups, plates, and cutlery. 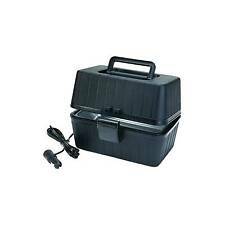 Cook sets are ideal for car camping and preparing meals away from your home kitchen. There are a number of different materials to choose from when buying camping cookware, and what you choose will depend on your needs. Aluminum is lightweight. It conducts heat well and is quite durable. Hard-anodized aluminum resists scratches and lasts a long time. It is a good lightweight option for backpackers. Stainless steel is tough and is super long-lasting. Titanium is very lightweight, heats up quickly, and is corrosion resistant. It is a great option for backpackers. How do you choose the right camping cookware? Type of camping: Will you be backpacking or car camping? Type of cooking: Will you be cooking over a small gas stove, open fire, or charcoal grill? Type of food: Do you want to cook complete meals or mix hot water into packets of dry ingredients? Available cleanup options: Will you have a sink with running water or not? How do you use camping cookware? You will adjust cooking times depending on the kit and heat source you're using. Aluminum and titanium heat up quickly, which amounts to short cooking times. When cooking on a camping stove, proper ventilation is necessary. 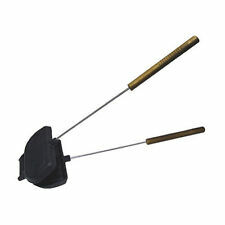 Place your stove on an even surface so that your pot is stable. When cooking on a camp fire, use a heavy-duty grill to support your pot or skillet. Make sure to use hot pads when grabbing the handle. How do you care for camping cookware? If your cook set is made of aluminum, be sure to fit the pieces back together carefully. Only scrub your stainless-steel pot with gentle materials. Before using it on an open fire or charcoal grill, coat the outside of the cookware pan or skillet with dish washing liquid for easy cleanup. Wash and dry all pots and utensils well before packing them away.